Event Wrap-Up: Kick Butts Day! 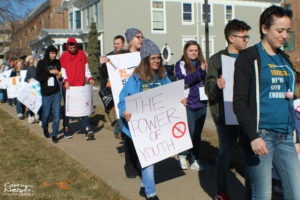 More than 40 Nebraska teens from all over the state gathered in Lincoln for the 14th-annual Kick Butts Day rally against Big Tobacco, part of the nationwide Kick Butts Day tobacco awareness campaign. We gathered Tuesday night for some training and to get to know each other, met with our senators Wednesday morning to discuss issues affecting our generation, then marched through downtown Lincoln before gathering on the north steps of the Capitol for our rally. Youth Board Co-Chair Kallyn Antholz, a senior at Johnson-Brock High School, has been involved with No Limits since she was in seventh grade and has seen firsthand the impact the group has had gave a speech at the rally. Group Feature: This Could be YOUR School! Are you part of a group that helps to educate your peers on the dangers of tobacco and nicotine? Have you done projects to help others see how Big Tobacco is impacting your generation? If so, we want to hear about it! Send us a picture and a paragraph about what you did, and you could be the next group featured. Or perhaps you love No Limits, and want to get your peers involved by forming a group at your school. Did you know our awesome Youth Board members will come to your school to give a presentation about No Limits? They might even bring you some sweet No Limits swag! Simply email us a timeframe that works for your school (be sure to give us a few date and time options) and we’ll let you know which option works best for our Youth Board members. When you’re ready to form a group, go to our website and request a Recruitment Mini-Grant to receive additional materials as you start to organize your group. A tobacco product that has recently been catapulted into the news are JUULs. According to Forbes, JUUL is the most popular e-cigarette in the United States. However, this is not the only alarming fact surrounding it or the reason it has been involved in so many conversations. 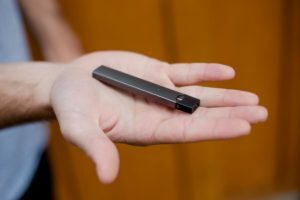 Many individuals are concerned about the marketing tactics the JUUL company has been implementing and the demographic they target. Whether it be the youthfulness of models utilized, the bright colors shown in images, or the posts found on social media platforms, it has become clear that the advertisements JUUL uses are marketed towards youth. Although JUUL has stated their only goal is to provide an alternative for cigarette users, an article written by CNN journalist Michael Nedelmen exposed emails which proved their intent to market toward a younger demographic since the beginning of their campaigns. Government officials have even started action to minimize JUUL’s impact on teenagers by cracking down on the flavors that are found in JUUL pods. Sadly, the initial lack of reaction will have a lasting impact on teenagers who have already used the addictive product. Because the amount of nicotine in a single JUUL pod is equivalent to the nicotine in an entire pack of cigarettes, the product has a lasting impact on first-time tobacco product users.